Doing keyword research for Local SEO has been somewhat difficult in the past, because many local search phrase combinations have relatively low volume, and the amount of data has been too small/granular for the limitations found in many keyword research services. 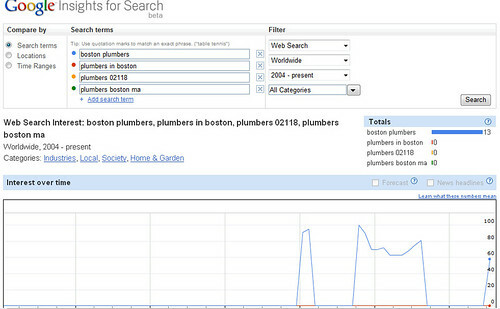 Even just a few years ago, I used to try to research local keyword phrases for things like “boston plumbers” in a service such as comScore’s qSearch tool, and such phrases would frequently have insufficient search volumes for the tool to reflect back any data. 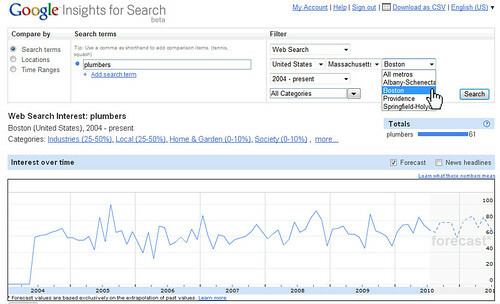 Even Google Trends today states that there’s insufficient volume to show graphs for “boston plumbers“. The reason why such research is important is because a site seeking to grab as much qualified traffic from consumers interested in a particular type of business as possible, must first know which phrase(s) to focus upon to achieve search engine rankings. They must answer the questions of whether consumers are searching for “plumbers”, “plumbing”, “plumber” or “pipes”. And for local businesses, it’s ideal to match for exact phrases that include local keywords. Do consumers search for “boston plumbers”, “plumbers, boston”, “plumbers in boston”, “plumbers boston ma”, or “plumbers 02118” (a Boston ZIP code)? There are cases that are even more complex, where an industry may have multiple terms used to find businesses (“accountants”, “accounting”, “tax preparation”, “CPAs”), and cities with multiple name versions and neighborhoods (“New York”, “New York City”, “Manhattan”, “New York, NY”, “NYC”, etc). The problem is irritating when there’s little recourse available for researching consumer behavior. As you can see, Keyword Discovery is showing that the phrase with the highest volume of searches that contains both “plumbers” and “boston” is “average annual wage for plumbers in boston mass” — which is somewhat surprising. One figures that there are likely a lot more consumers trying to locate plumbers than there would be plumbers looking up wage info or prospective employees of plumbers. There are multiple possible explanations for this surprising result. For one, it could be that someone has linked-to or set up a script to frequently execute searches for this info. For another, there could just be an unusually high number of those searches happening just in the sample of data that Trellian has access-to. Trellian and other keyword research providers obtain usage data from ISPs and some search engines (typically some of the lesser search engines) which they compile. Since this is a subset of all internet usage data, it’s good to realize that searches with smaller volumes like our example can skew results a bit — so, one must interpret it with a critical eye. The results also show a number of search permutations involving “local 12” and “local 112”. These are unions, and those searches probably were not from individuals seeking plumbing services. 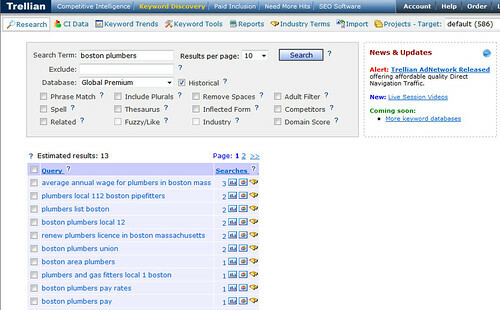 Two of the remaining search phrases we see are for “plumbers list boston” and “boston area plumbers”. Both of these are interesting/worthwhile results, particularly since we didn’t initially anticipate those phrases. That second phrase, “boston area plumbers”, is likely of prime benefit to us if we were a local plumbing company. Boston, like many major metro areas, is made up of a conglomerate of smaller towns, so it might be very natural for locals to search “boston area plumbers”, knowing that while there might not be a plumber located directly in their specific town, there could be one in the town adjoining theirs. 5minutesite.com’s Local PPC Adwords & Keyword List Creator by Walter Spurgiasz is pretty good for generating a large list of permutations of local keyword phrases. You submit keywords, a ZIP code and radius, and it will incorporate names of towns within the searched radius and add them onto your keyword phrases. Another similar tool is the Local Keyword Research Tool. These tools are good for coming up with phrases and ideas, but they’re not going to tell you which word/phrase is more popular than another. In the case of our “Boston plumbers” example, though, these tools could be very useful since they’d spit out a great many of the local town names which you’d want to also target for local searchers. Ultimately, we may find that we might need to target phrases which include town or ZIP code names less in the future, since search engines such as Google are increasingly returning back local results for broader keyword phrases, targeted to consumers’ geographies (by using IP addresses and a number of other geotargeting techniques). For instance, when you search for just “plumbers”, Google now returns back a handful of organic search results PLUS a map 7-pack of local businesses in your area which are plumbers. This evolution in search engine function is likely to alter searchers’ behavior as they grow accustomed to it — they’ll waste less time in typing in their city names for a local business, so the volumes of searches with the longer local phrases will decrease. Trellian Keyword Discovery also allows one to filter down geographically, but the refinement is insufficient — only allowing one to refine by country. Good keyword research requires some experience and intelligence, coupled with the ability to imagine how consumers attempt to find your business online. I’ve often found that companies have become somewhat biased by terms they consider to be important to their own industry insiders versus the keyword terms that consumers actually use to find them. Imagine the case of a prestigious tailor who desires to rank well for “bespoke tailoring” whereas he’s ignoring the many consumers who might find him if he targeted “custom suits” instead. Periodically revisit assumptions about how consumers may search for your type of business, and avoid vanity terms. Matt McGee also wrote some great tips last year on this subject at When Local Keyword Research is a Dead End – it’s worth reading as well. This entry was posted in keyword research, Local Search, SEO and tagged Google Insights, Google Trends, keyword discovery, keyword research tools, local keyword research, local keyword research tools, local seo, trellian by Chris Silver Smith. Bookmark the permalink. Nice post — yes, metro areas such as Pittsburgh and Boston have many smaller towns, and people will often search for those towns, instead of ‘Pittsburgh’, so they might look for “insurance agents gibsonia, pa”. What I try to do is also capture those keywords during the keyword research phase and integrate them into the website’s SEO strategy. Great post Chris. What we usually do is run a PPC test for a month or so to make sure the keywords we’re intending to optimize are in fact the one’s that have search volume and high consumer intent. Generally, we’ll focus on the main metro areas and then include city landing pages for suburbs and smaller towns which are easy to rank for. Dev, I think using landing pages to target each different local area is a great strategem for local SEO. Using PPC ads to doublecheck search volume is a great idea, too – although I’ve had small business clients who’ve balked at doing anything with paid, sometimes. Hey Chris great post. Local search is defiantly a pain when it comes to search volumes. I always go with a themed page that carries multiple tags to accomplish my goals. Even still, you can capture all the related terms to location, etc… but the bottom line still is how many people are searching and how many people are clicking. The trick here is to determine your strategy first and foremost. Are you going for the long tail or the short? Are you employing full frontal assault or a flanking maneuver. All these tools are handy for their niche. Nice post incorporating them all into a coherent and well defined listing. Bookmarked your site. Thanks. I’ve been using Google’s keyword tool for about one month in doing SEO. Now, my website traffics doubled because of this tool. I do a lot of work with local SEO. Because of the lack of volume in the data, I am forced to improvise. I usually do the research on a national scale first to determine the most frequent keywords without the City name in them. I then make the assumption that local users are going to search using those common keywords with the locality attached to them. Kathy, that’s a fairly safe method to use, for most cases, but it’s good to check assumptions whenever you’re able to do so. There are some definite regional differences in keyword usage which can impact your optimization efforts. For instance, in some parts of the country, people use “sack” or “bag” versus “purse”. The same with “soda” versus “pop” versus “soft drink”. Also, the way people refer to their city is very different in different geographies — people in New York City often use “NYC” when searching, and “Fort Worth” can also be spelled “Ft. Worth”. But, in many cases, we have to use the national keyword search data as you’re describing, and assume that it will apply similarly to the specific locality. Have any of you ever ran a PPC campaign for just a month to collect some real data on a pool of keywords? For some of the smaller towns, it’s really useful and it doesn’t cost much. I’ve had a lot of success with this and it can really steer SEO efforts when you have an accurate list of keywords that are popular. And now with Google Boost, you could run a campaign for a month and it does the setup automatically! Thanks for an interesting post, more so for me because right now I am working with a local accountant and am coming across many of the issues you raise. As previous posters have mentioned our approach is to look at national data and assume that users will add on their city name. Thanks for the great info Chris and be welcome to drop by in our little paradise anytime! I’ve been searching far and wide for information on keyword research for local businesses, since I’m now starting to enter that market. And it’s been almost impossible to find good information. This post probably has some of the best information that I’ve found so far. 1. Do keyword research on a national level. 2. Do keyword research on a local level by making some assumptions from the data gathered from step 1. It seems like you can still get some good data from the Google keyword tool at the local level, it’s just incomplete. 3. Run an Adwords campaign for 30 days where possible to get some concrete data on the keywords that you’ve found so far and then use this data to optimize the client’s site. Thanks again to everyone who contributed to this post!